The first season of the television adaptation of A Discovery of Witches was so successful during its run on AMC Networks subscription services Sundance Now and Shudder, that it will now be shown simultaneously on AMC & BBC America following the Season 2 run of the hit series Killing Eve, starting April 7th. A Discovery of Witches is based on the first book in the All Souls Trilogy by New York Times Bestselling Author, Deborah Harkness, and tells the story of a world in which Witches, Vampires, and Daemons coexist with humans, but are seeing their numbers dwindle at an alarming rate. 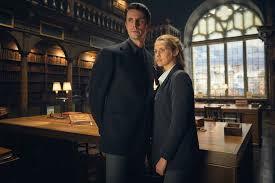 When academic and witch Diana Bishop (Teresa Palmer) calls up Ashmole 782 from the depths of Oxford’s Bodleian Library, she triggers a chain of events that put her life in peril, and lead her to find comfort, protection, and love, in vampire Matthew Clairmont (Matthew Goode). She’s forced to flee from vampires and witches who would use her and her abilities for their own aims, all while condemning her relationship with a creature of a different species out of some outdated notion that cross species relationships are dangerous. The intrigue and romance of A Discovery of Witches intrigued viewers so much that it smashed Sundance Now records for total video plays, with the service seeing a 30x increase in streams over any previous premiere during its first week – a record number of minutes streamed – and accounted for more than half of all streaming activity on the platform. Ahead of the series’ premiere, total subscribers to Sundance Now increased by nearly 30% from the start of January, and the week in which it premiered, ending January 20, saw the largest number of new subscriptions, almost double the number added in any previous week. For Sundance Now’s sister service, Shudder, the series was also a monster hit, accounting for more minutes streamed than any on-demand film or series premiere in the service’s history. A Discovery of Witches was such a smash hit in the UK, on production partner Sky One, that it was renewed for a second and third season before it even hit the US, and is due to resume production later this year with an air date for Season 2 yet to be announced.